All key personnel listed on review applications submitted to the Allen College Institutional Review Board (ACIRB) must complete training in the protection of human subjects before an application will be reviewed. Data collection and contact with human subjects cannot start until written approval is received from the ACIRB. Key personnel include the principal investigator, co-principal investigators, supervising faculty member, and any other individuals who will have contact with the participants or the participants' data (e.g., interviewers, transcribers, coders, etc.). 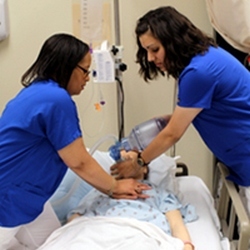 Allen College subscribes to the Collaborative Institutional Training Initiative (CITI) Program for ACIRB members, faculty, students, staff, and UnityPoint Health—Waterloo associates. The ACIRB will also accept National Institutes of Health (NIH) Protecting Human Research Participants Training. Certification of training from other providers may be submitted and will be evaluated by the ACIRB for adequacy and appropriateness on an individual basis. Training certificates are honored for a five (5) year period beginning on the date that the training was completed (not on the date of submission to the ACIRB). The date training was completed can be found on the certificate of training given by the provider after the course is successfully completed. Once the 5-year anniversary date is reached, key personnel must complete a new human subjects protections training course or renewal course to be eligible for new proposal reviews. Proof of CITI training completed through Allen College's CITI subscription will be verified by the ACIRB. Key personnel who complete CITI training through Allen College's CITI subscription do not need to submit the completion report with the ACIRB review application. Key personnel who complete CITI training as independent learners, or through another institution's subscription, must include the CITI completion report along with the submission of their review application. Go to http://phrp.nihtraining.com/users/login.php and register. There is a fee for the course and associated certification. Sign up and complete the Protecting Human Research Participants program. Once completed, you will be awarded a certificate with your name, the name of the course completed, the date of completion, and a certificate number. Please copy this certificate and email it to ACIRB@AllenCollege.edu.